The news we read every day in the media, recession, financial problems, daily stress and moodiness gives us a feeling that we have knots in the stomach but in fact our heart is at more risk. That’s because crisis means extra stress and this in turn translates to extra pressure on one of the most vital body organs. We should all be reminded not to neglect the health of our hearts, especially in difficult periods. Our diet and lifestyle play an important role for heart health and this is what we will discuss below. For many years, experts suggest that the best diet plan for a healthy heart is a diet low in fat and high in carbohydrates. During the last decade this has slightly changed. In a recent cardiology conference there were many cardiologist who argued that a diet low in carbohydrates may benefit the female heart, while fat consumption is not necessarily negative – depends on the type of fat. All these are good sources of vitamins and minerals and they have several specific antioxidants that benefit the heart. They are also low in fat and high in sodium and fiber. Five portions of fruits and vegetates daily, can reduce the likelihood of cardiovascular disease by 18%. Fish (such as sardines and salmon) contains omega-3 fatty acids that keep blood pressure low. It is one of the most important “weapons” of the Mediterranean diet, which is a top preference for nutritionists Worldwide. Studies show that the monounsaturated fat in olive oil reduces bad cholesterol (LDL) without throwing good cholesterol (HDL). At the same time, however, it is advisable to reduce the intake of saturated fats like those found in red meat and dairy products and to entirely avoid trans fats, i.e. those found in junk food. Nuts and seeds are another important component of the Mediterranean diet since they are full of “good” fats. Walnuts, for example, have been proven to lower triglycerides and increase good cholesterol. Moderate alcohol consumption can increase the good cholesterol while the grape skins used to produce red wine contains antioxidants which prevent thrombosis of blood vessels. Limit your exposure to bad news and your heart will be grateful to you. 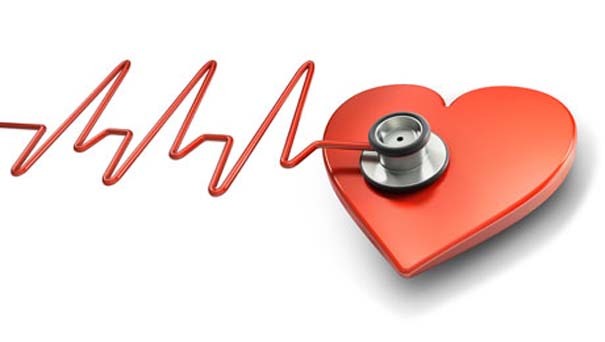 No need to constantly monitor the ups and downs of the stock market, the euro and the new economic measures: Our body reacts to stress by generating hormones, such as cortisol and adrenaline, the constant presence of which may pose a risk for heart diseases in the long term. The benefits of exercise are very well known to all, there is no need to remind you again that sedentary lifestyle is bad for heart health. We remind you, however, that in a time of crisis and persistent stress, your health may depend on exercise. Rather than rush to return home to drown your pain in pizza and television, take a refreshing walk, do a short exercise at home and in general keep your body in motion. Sleep does not simply relax us but actually reconstructs our body, “correcting” the losses suffered during the day. To sleep better, avoid stressful activities shortly before going to bed. You may never have such problems, but in difficult periods the most “insidious” disease of our decade hides in every corner and affects not only our behaviour but also the health of our heart. Depression is an indication that the brain and body have gone into a situation that makes them more prone to diseases. Therefore, it is important to keep looking for the signs of depression, whether they are found in the mirror, friends or family. Make sure you have real control of your routine. Organize your time and your program to adopt a well-conceived routine in which everything will work as planned without creating extra stress, anxiety and insecurity. It is important to perform medical check-ups on a regular basis. If you already have a history of health problems, this is an additional reason. Smoking increases blood pressure and thrombosis in the blood makes exercise more difficult, creating a vicious cycle for our health. When you quit smoking the results are visible immediately as within a few days, the chances of a heart attack are greatly reduced. Learn to relax your mind, and therefore your body. Try methods such as deep breathing and meditation or just do things that calm you – for example talk to friends and share your problems and thoughts. All these simple actions can keep blood pressure low and reduce stress hormones in your blood. The heart is the most important part of our whole body. We have to keep this in a healthy state if we want to enjoy the life. In this context, You have really done a better job. Thanks a lot for sharing such an extremely useful post with the readers. Keep sharing.